Dino Meneghin closed his legendary career between Trieste and the return to Milano because he was a miracle of longevity, and still his true career was the one that in the 70s had him as the cornerstone of the great Varese team and in the 80s of the Milano’s one. Born in Alano di Piace, in the Belluno province, but raised in Varese, he began his basketball career leaving the shot-put and quickly becoming a star. After being crucial in the Varese’s dynasty establishing himself as the Milano’s principal opponent, in 1981 he was traded to Olimpia while Varese was about to close its golden era and Milano was about to start its one. In spite of postponing his debut because of an injury, Meneghin changed the story of the big Dan Peterson’s team, leading it to the Italian title in 1982 and to eight consecutive finals appearances including five victories, plus two European championships, a Korac Cup, the 1987 Grand Slam. He formed a terrific tandem of big men with fantastic players, like John Gianelli in the beginning, Joe Barry Carroll giving away many offensive responsibilities, and finally Bob McAdoo. 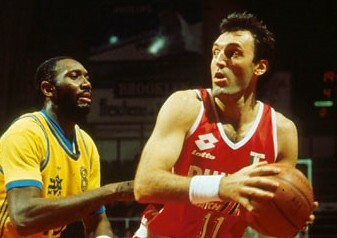 Meneghin, a rebounder, a defensive player, a great leader and fighter, was the Italian National team top player until 1984. A better offensive player that he was credited for, a physically terrific center, he was the first Italian to be elected to the Springfield Hall of Fame as a player. His Milano’s experience was also remembered for some controversial episodes, like the ejection from the Bologna’s final series in 1984 that forced him to miss the decisive game 3, probably the key factor of the series. With the Italian National Team he won the European championship in 1983, the silver medal at the 1980 Olympics, in 1970 he was drafted by Atlanta and in 1974 he received an offer to join the New York Knicks team, the first Italian to gain NBA’s attention.